Danu of the flowing waters, Queen of the fertile land - the Great Mother Goddess of the Irish Celts. Known as Don by the Welsh Celts, she is the Creator Goddess of the Tuatha de Danann, the first of the Celtic tribes to invade Ireland. She gave birth to all life in the land of the Celts and is also known as Danann, Ana and Anann. While few stories of her survive, she is the most ancient of all the Celtic deities. She is associated with water - the seas, wells, springs, and the Danube River. She is said to give her children the magic of transformation, inspiration and wisdom. Also known as an Earth Goddess, she gives abundance embodying the wisdom of living in balance with nature and the Earth. 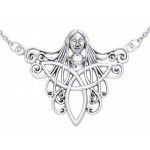 She is also connected with Brigid, Goddess of Healing, Poetry and Smithcraft. 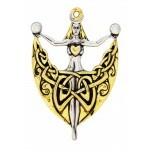 Being the Goddess of Life, her counterpart is the Morrigan, the Celtic Goddess of Death. Her colors are the blue of the waters, green of the Earth, and silver/white of inspiration and Divine wisdom. She is associated with mares, snakes, seagulls, and fish. Her sacred trees are the rowan tree, the apple tree, and the hawthorne. Danu calls us to recognize the abundance of life lighting the fires of inspiration connecting us to the Divine spark. She helps us find our creativity and the power to transform to new beginnings. 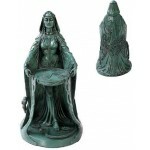 0 Comments To "Danu - the Celtic Mother Goddess"